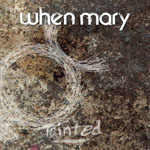 Share the post "Album review: WHEN MARY – Tainted"
The second album from Norwegian art rock band When Mary – Trude Eidtang (vocals, synth, percussion, glockenspiel), Christian Paulsen (guitars, programming, synth, bass) and Vidar Uthaug (synth, organ, korg, Rhodes) is a rather enchanting affair. That is if, like me, you have guilty soft spot for the likes of Enigma’s brand of pop/rock circa MCMXC A.D., combining Gregorian-chant like vocals and symphonic instrumentation. Following their 2013 debut 7summers7winters, When Mary mix art-pop and trip hop with the vocal elements of symphonic rock, Trude Eidtang (White Willow) finding her inspiration in the eighties and nineties with artists like Sade, Peter Gabriel, Eurythmics and Kate Bush. Several of the intros/interludes would be well placed in an Enigma release – heavenly, angelic, choral lines, chiming abbey bells, swelling Phantom Of the Opera church organs, and dramatic operatic arias. But at its heart – Eidtang’s sumptuous symphonic vocals aside, Tainted marries the pop sensibilities of Duran Duran, with the dirty synths sound of Soft Cell, and with chunky distorted guitar riffs beefing out the overall sound. This entry was posted in ALBUM REVIEWS, ALBUM REVIEWS (Mobile), All Posts and tagged album, ambient, art rock, electronica, pop, review, Tainted, Trude Eidtang, When Mary, White Willow. Bookmark the permalink.